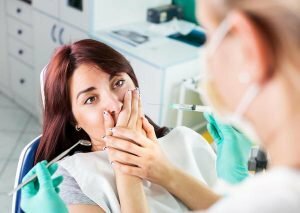 Many of us get nervous before seeing the dentist, and dental phobia is a common malady. But surrendering to dental phobia can negatively impact your oral health, smile, and general wellbeing; particularly if it leads you to delay or avoid routine oral examinations at West Ryde Dental Clinic. Beyond your recommended daily brushing and flossing, a twice-yearly checkup (and often a clean) is the best thing you can do for oral health. There is also a strong connection between your oral health and your health in general. This means that taking good care of your teeth and mouth is a major part of caring for your whole body. Unfortunately, patients with dental phobia often avoid or skip these important dental visits. Missing dental visits has potentially disastrous long-term effects. To understand the phobia, its effects, and how to beat it, West Ryde Dental Clinic has compiled the following information on dental phobia and how to fight it. Trouble sleeping or feeling tense the night before a dental exam. Becoming increasingly nervous while you’re in the waiting room. The sight of dental instruments, or of white-coated staff at the dentist’s office, ramps your anxiety up. You have difficulty breathing or panic when fingers or instruments are placed in your mouth during a dental appointment. Bad experiences with a previous dentist. PTSD. Patients who already have unrelated anxieties are more likely to have dental anxiety. Negative dental images and/or information in the media, such as representations of dentists in movies like “Marathon Man”, may trigger anxieties. Fear of needles, injections, drills, etc. Mild dental phobia can be addressed in several ways. Talking to your West Ryde Dental Clinic dentist is an excellent step towards overcoming your dental phobia. Make sure we understand your precise anxieties so we can work with them to make your time in the dental chair is as relaxed as possible. Controlled breathing shifts your focus to other things and relaxes your body in order to take your mind away from the dentist’s office. The easiest breathing technique is inhaling and exhaling through your nose for a slow count of three as the breath goes in, then to three again as the breath goes out. This technique also helps overcome the breathing issues many of us feel when things are in our mouth. Relaxation techniques can also work. Bring music into your appointment, request your favourite radio station, or have the nurse chat to you. Different distraction and relaxation methods are effective for different people so find something that works well for you. Severe dental phobia often cannot be dealt with through the steps above. Severe dental phobia is less due to simple nervousness and more due to irrational fear. You can fight back against severe dental phobia in a few ways. You can take counselling to deal with your phobia. Counselling addresses underlying causes of your phobia and helps you work through it, to move past it. Dental anxiety is common, and there are a wide number of support networks for people with these phobias. They can often be found online. Anaesthetic/Sedation is another option for severe sufferers of dental phobia. If non-medical remedies are not enough to control a patient’s anxiety, anaesthesia and medical sedation can come into play. Modern local anaesthetics are powerful. After numbing with a topical anaesthetic, our office gently injects a local anaesthetic that blocks all pain. Different types of sedation are available. The simplest is oral sedation, which is a tablet that you swallow an hour before the start of dental treatment. You will still be awake and aware of what is happening around you, but you will also be drowsy and more relaxed. If that isn’t enough, you might choose intravenous sedation. This is an injection, so if part of your dental phobia is related to injections, it may not be for you! You will not be unconscious; however you will be in a profoundly calm state and may not even remember your treatment when you are done! At West Ryde Dental Clinic, our treatments and service are 100% personalised to you and your needs. Our dentists are highly motivated and accredited practitioners with graduate degrees from the University of Sydney. Alongside our dentists, the supporting staff at West Ryde Dental Clinic are tremendously dedicated and experienced to ensure that each visit with us is as pleasant as possible.